Hangzhou city in southeast China has become the most magnificent city in the world. History says, the governor, known as Su Dongpo (1086-1094), transformed Hangzhou into a city of superbly designed gardens, stone bridges and lakes. Visitors to Hangzhou´s famed West Lake are greeted by a stone statue of Governor Su, a statesman during the Song Dynasty, who´s also an adept artist and calligrapher. Hangzhou, which basked in splendour some 2,000 years ago, remains as elegant and charming as today. There is a unattractive about Hangzhou that makes it "different" from other crowded, Chinese cities that have the worst air pollution. In China, there is a saying: "Xia you su hang, shang you tian tang" which means "down here is Suzhou, up there is heaven (a city in eastern China) and Hangzhou." I instantly understand the meaning of the saying when taking a boat cruise on West Lake and marvelling at its beautiful scenery. Across the three mountains, the 60 sq km West Lake has top 10 spots with poetic descriptions about their scenes. They are: Orioles Singing In The Willows, Breeze-ruffled Lotus At Quyuan Garden, Autumn Moon Over The Calm Lake, Three Pools Mirroring The Moon, Lingering Snow On The Broken Bridge, Viewing Fish At Flower Pond, Spring Dawn At Su Causeway, Twin Peaks Piercing The Cloud, Three Pools Mirroring The Moon and Evening Bell Ringing At Nanping Hill. While walking at the lake, I take on a musing mood and come up with a verse or two such as "Going to Hangzhou without cruising the West Lake is like going to Beijing without climbing the Great Wall". Fittingly, Hangzhou also has a great love story to tell - that of Lady White Snake Bai Suzhen who married scholar Xu Xian. Sometimes later, Bai was captured by a monk and imprisoned in a deep well at the Leifeng Pagoda (near West Lake). Charmed by the story, I visit Leifeng Pagoda. 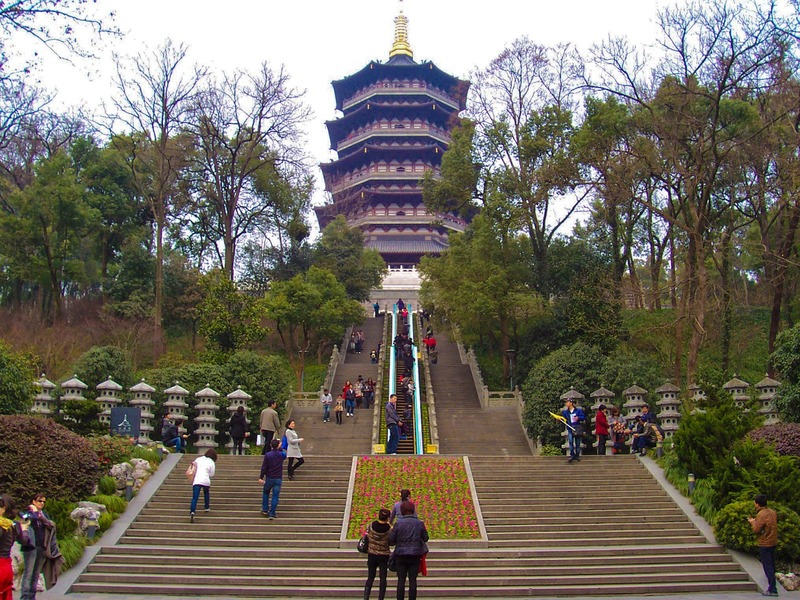 It´s a place where technology and mythology meet, as it is the first pagoda I have ever visited which has escalators. How about escalators at Batu Caves? West Lake is like a beautiful woman that wears different clothes for a seasons. It takes on a different look for each of the four seasons as willows, plum and lotus flowers take turns to dress the realm in summer, autumn, winter and spring. 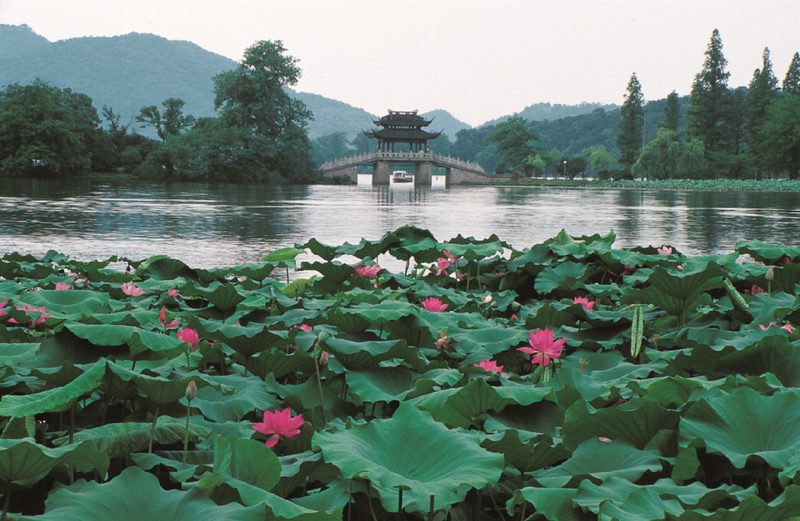 For spiritual purposes, Hangzhou has ancient temples, cultural, pagodas places and scenic spots to keep them occupied. There is Phoenix Mosque for the muslims, one of the four ancient mosques built in southeast China during the Tang Dynasty, and was rebuilt in 1281 by a Persian named A-La-Ding. 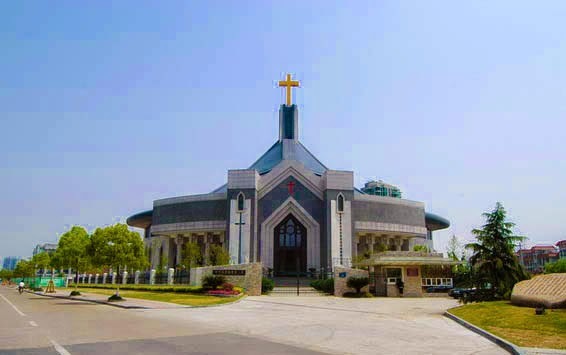 The Christians have a chance to visit the biggest cathedral in Hangzhou which was built in 1661 by an Italian clergy, Martino Martini. On the commercial front, Hangzhou is a thriving city dotted with restaurants, shopping centres and hotels.With more than 9,700 restaurants, it is known as the City Of Gourmet Food. The peoples of Hangzhou, proud of its rich culture, generally feel that they have "better living conditions" than the inhabitants of Shanghai. Obviously, there is an on-going rivalry of sorts between the folk of Hangzhou and Shanghai, only 45 minutes away by bullet train and three hours by bus. 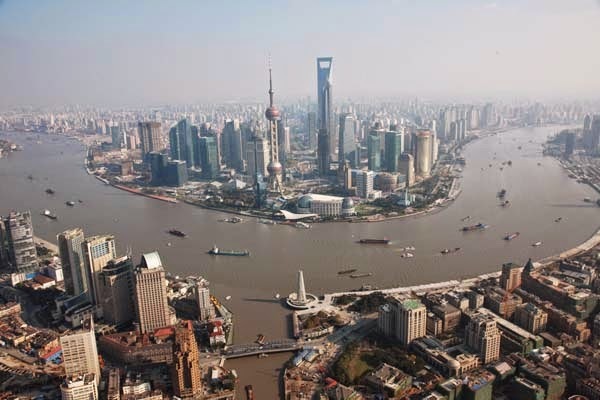 Hangzhou citizens like to say that Shanghai (15 million population) is a city of huge shopping complexes whereas Hangzhou (six million population) is a garden city with clean streets. In this case, which is better to you, live in a garden or in a shopping center? Shanghai people are busy making money so they live a stressful life. Hangzhou people are more friendlier and relaxed. From my experience, I agree. Hangzhou folks are indeed more accommodating than their Shanghai counterparts. Marco Polo, I´m sure, felt the same way too.